Kayaks have a lot to offer to the sport of fishing, as well as folks who just want to enjoy a nice paddle. In recent years the versatility and capability of fishing kayaks has brought them into the spotlight, and they have become incredibly popular with anglers as a result. Whether you are out for a fishing adventure or a pleasure ride, you need something to carry all that essential gear. But how can you know which kayak will get the job done from nothing more than a few brief descriptions online? That’s why Fly Fishing Atlas brings you the top kayaks for fishing. Which style and size kayak will get the job done for you will depend on your preferences and gear carrying needs. We love a good day on the water, and we thoroughly enjoy great performing watercraft. We want you to find the right kayak that works for you. Anglers have enjoyed fishing from kayaks for many years. But in recent years kayak designers have focused on features specifically designed for the needs of anglers. Along with rethinking basic dimensions, manufacturers have integrated comfortable seating and have increased stability for ocean use, and even standing. A few questions you should ask yourself is how you intend to use your kayak. Do you want to use your kayak in lakes, fast flowing rivers, or the ocean and surf? Do you want to be able to stand up if needed? Where do you intend to store your kayak? How will you transport your kayak to the water? Stability – Longer and wider kayaks are more stable and better suited for ocean use, but they will require storage space or roof racks for transportation. The ability to stand in a particular kayak will depend on your sense of balance. Storage Space – If you just don’t have enough space for storing a big kayak, you might be pleasantly surprised that inflatable kayaks can pack away in very small spaces. And transportation really becomes a non-issue since inflatable kayaks can easily fit in a compact car. Ease of Transport – Moving a large kayak might require a helping hand or a kayak trolley if you need to walk a distance from your vehicle to the water. Comfort – A long day on the water is only going to happen if you can remain comfortable. A comfortable seat is going to be a big necessity, but the ability to temporarily stand and stretch your legs and back is a great benefit as well. Fishing Features – If you are doing serious fishing, like tournament fishing, you’ll want a kayak with features like multiple rod holders, Scotty Mounts for fish finders, and gear tracks for other accessories. Sealed hatches are good for keeping your other gear and food dry and protected. We recommend 12-13 foot kayaks for fishing primarily due to being an overall more capable watercraft. When nature throws a curve-ball at you, a bigger kayak will handle a variety of circumstances better than a smaller boat. Small kayaks transport easily, but they still require significant storage space, and are less stable. Many anglers who have invested in a fishing kayak say they wish they had bought one years ago – as they could have done a lot more exploring and fishing. For those looking for the short version: The top choice for fishing kayak is the Vibe Sea Ghost 130 Angler. Meeting at the perfect crossroads of affordability, portability, and capability, this kayak continues to impress. The solid quality and features rival those of boats costing almost twice as much. You can see our full review below. This 13 foot kayak is a well-crafted boat with a wide hull to maintain stability in the river or the surf. If you are in the market for an affordable and capable kayak that is stable and ready for fishing adventures, then the 13 foot Sea Ghost 130 should be at the top of your list. With a 550 pound capacity and enough room to carry a pile of gear, this is a solid kayak with all the capability of much more pricey boats. The Sea Ghost 130 has a well-balanced layout that is loaded with features for the fishing enthusiast. And the dual position Vibe Hero seat makes full days of exploring and fishing a remarkably comfortable experience. The 13′ length and 33″ width is enough to punch bow-first into the surf. But the kayak will also track in a straight line very easily compared to shorter models that will have you zig-zagging across the water. The width is well suited for quick paddling while offering great stability in rough conditions, or for anglers who like to stand or stretch while fishing. The kayak is equipped with plenty of gear mounting options. Two rod holders sit flush with the body of the kayak and come equipped with caps for when they are not in use. The kayak comes standard with a fish finder transducer port with mounting points and a lid to provide protection. If you need to mount more rod holders, long integrated gear tracks provide mounting points for a wide array of accessory mounts. Durability is inherent in the rotomolded single piece high-density polyethylene hull which is a super rugged material designed to take the abuse from dings and shallow water encounters with rocks. And for boats that see a lot of heavy use and contact with abrasive surfaces, the skid plate is replaceable. Vibe placed 10 scupper holes throughout the body of the Sea Ghost to allow water to drain off the surface of the kayak and includes plugs to close them when desired. For cargo storage, the Sea Ghost 130 has 2 sealed hatches with bag inserts to keep your gear from resting in any residual water that might be on the bottom of the hull. The large rear tankwell provides a generous space for carrying gear topside and an adjustable bungee helps secure your gear. The sealed center console is great for extra gear, tackle, or your lunch. The cover features multiple accessory mounting points for items like additional rod holders or a fish finder. To keep your tackle close by 2 tackle box slots are located at the side of the seat. Vibe recommends the PLANO 3600 tackle tray to allow the bungee retention cord to properly secure your tackle. The Vibe Sea Ghost comes with a preinstalled foot-controlled rudder system which enhances tracking in the wind and chop. And when you need to move the boat out of the water, 4 easy grip carrying handles provide the leverage you need to load and unload. Before you choose a kayak to hit the water for a fishing adventure, one thing should be prioritized more than anything else: safety. Safety gear is going to vary depending on your conditions, but a personal flotation device is a wise place to start. The NRS Chinook PFD is a great combination fishing vest while also providing flotation and safety in the event of an accidental swim. And no matter how wonderful the price tag on a kayak might be, you should never compromise safety to save a few bucks. Fortunately, the 13 foot Sea Ghost 130 has a reliable and stable design with a proven track record for safety. Besides using high quality materials in the construction of the kayak, there is another safety feature. When the hatches and scupper holes are sealed the design creates a large sealed air chamber within the Sea Ghost 130. This air chamber provides buoyancy in the case of an accidental overturn. Users report a variety of methods for transporting the Sea Ghost 130. Weighing in at 75 pounds, the kayak rides best on a roof rack during transport and some mention that a kayak trolley makes walking with the boat a snap. Buyers comment that the kayak is built to a very high standard, with quality and features on par with boats costing almost twice as much. Many also applaud the comfortable and adjustable hero seat that makes long days on the water enjoyable. Others enjoy the preinstalled foot-controlled rudder system for tracking in the wind and chop . Almost all users of the Sea Ghost 130 report that it is a fantastic kayak. They compliment its stability, and storage capacity. Users consistently say that after months of shopping around they could not find a better kayak to match the price, quality, and features. Our recommendation is to choose this kayak if you are in need of an inexpensive, maneuverable, and highly capable kayak for fishing or general kayaking. Vibe offers other kayaks that range from their smaller 9 foot long Skipjack 90 up to their tandem paddler 13 foot Yellowfin 130T. But for the price, this one offers the most value and practical function for anglers and paddlers alike. If you are not familiar with NRS whitewater rafts, you should know they have a truly incredible reputation. From fishing guides to rafting guides, you’ll hear the vast majority of them recommend NRS rafts, hands down. The NRS Pike Kayak maintains the same ridiculously high standard that NRS sets for all their boats. In certain circumstances the NRS Pike has some real advantages over hard-hulled kayaks because it is an inflatable kayak. Like their whitewater rafts, NRS incorporated a self-bailing floor while designing the Pike kayak. Whether you are busting waves in the surf or whitewater rivers, any water that splashes into the boat just drains out through the drop-stitch floor. The Pike features a 4 inch thick high-pressure inflatable insert on the floor which creates a flat and firm platform. To ensure durability in harsh environments, NRS uses a rugged PVC construction that is built to last. With a length of 12 feet 8 inches, the Pike inflatable kayak tracks very well for a lightweight kayak. NRS offers 2 tracking fins which are a large 9 inch and small 5 inch design. The fins add to the kayak’s ability to track, but they are also removable if you need to make quick turns in rivers and don’t want straight tracking. Another advantage the NRS Pike has over many other kayaks is a very wide footprint. The Pike is 39 inches wide, so you might need a longer paddle. When compared to other kayaks that width will make a significant difference in stability. For anglers that like to stand when fishing that is a big plus. The interior width of 17 inches is wide enough for a milk crate, large tackle boxes, and a wide variety of other fishing gear. The lightweight nature of the NRS Pike is particularly appealing to paddlers who want to avoid a boat that can be difficult to load, store, and transport. When deflated, the NRS Pike rolls up and fits in the included 14″ x 32″ storage bag. The bag also features backpack straps if you want to walk the kayak to the water before inflation. But with an assembled weight of 46 pounds, that is around 30-40 pounds lighter than other kayaks of this size. The NRS Pike features Leafield C7 Valves that make for really easy inflation/deflation of the tubes and floor. And carry handles in front and back provide easier movement. Buyers comment on using the NRS Pike in class III whitewater. Most guides agree that the NRS line of rafts more than satisfies their needs. They say it is an enjoyable boat, handles terrific, and isn’t overly difficult to move around when out of the water. 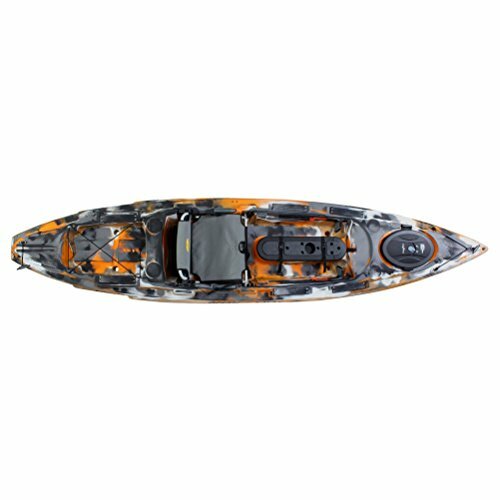 The Pescador 12 from Perception Kayaks is proudly designed, molded and hand assembled in the USA and backed by a 5-Year Warranty. Couple that with a very reasonable price and its not hard to see why the Pescador 12 is worth looking at. 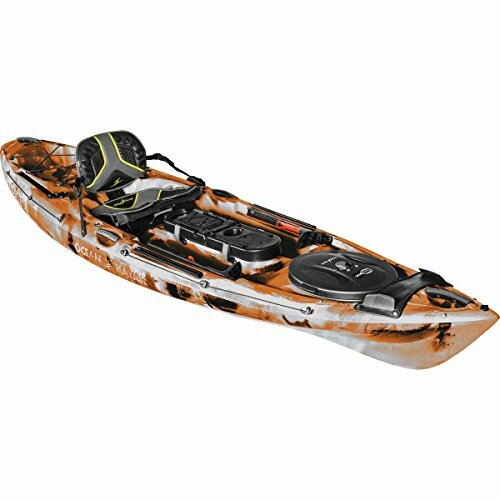 The Pescador 12 is an excellent choice for the fishing fanatic or paddling enthusiast. The out-of-the-box features make this boat ideal for new paddlers and anglers alike. Stability is an obvious factor to consider with any kayak. The width of 32.5 inches provides good stability when getting in and out of the Pescador 12. The stable design easily tackles calm lakes, slow moving rivers, and calm coastal waters. Open fresh and saltwater use is also fair game. Use in the surf and waves is possible but really depends on the paddler and their sense of balance. The Comfort Seating System is very comfortable, adjustable, and back-friendly. The seat has thick ventilated cushion padding and an adjustable seatback that reclines forwards or backwards. Footrests are also included and are easily adjustable for paddlers of all sizes. Out-of-the-box fishing and storage features offer good gear carrying capacity and functional performance for fishing. The stern of the boat features a large tank-well providing spacious open storage. While the bow hosts a covered and hinged hatch for dry storage below deck. Immediately behind the seat are two molded rod holders if you need to keep more than one rod ready for action. After-market accessories are accommodated by gear tracks on each side of the boat, as well as a molded-in Solo Mount recess on the center console for additional accessories like rod holders or fish finders. The molded skeg, or tracking fin, as well as a defined keel keeps the kayak tracking nicely while paddling. Unlike many kayak designs, the skeg on the Pescador 12 sits quite high and won’t drag bottom or become damaged in shallow water. The skeg also features an easily replaceable skid plate. So you can drag your gear-loaded kayak short distances without fear of damage. Four carry handles on front, rear, and sides help when transporting the boat. Perception Kayak designed intrinsic durability into the Pescador 12. With an industry-leading rotational molding process, and proprietary high-density polyethylene, this kayak is built to withstand impact and abrasion. 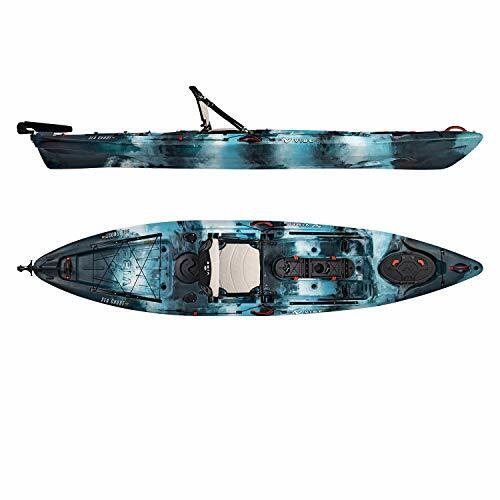 The hull is highly UV resistant to prevent fading and make the color and graphics wear-proof. Buyers comment on the great price of the Pescador 12. Some mention the lack of paddle and scupper plugs, but leave good reviews regardless. They say it is very stable, easy to maneuver, tracks very well, solid boat for the price and light enough to carry to the waters edge if needed. Ocean Kayak has a truly incredible reputation. From sea to shining sea, you’ll hear anglers and serious paddlers recommend Ocean Kayaks with little hesitation. There’s no denying that their quality and performance is exemplary, but you’ll also pay a little more for it. For serious anglers and fishing tournaments, the Trident 11 from Ocean Kayak has a lot to offer. This boat is loaded with features and tailor-made for various fishing needs. When the plan of attack changes, the Trident 11 is up for the challenge. This 11 foot 6 inch kayak is a top-of-the-line boat that Ocean Kayak recommends for slow moving rivers, and moderate ocean swells. Being the most compact in the Trident line, agility and easy transport are just a few of it’s strong points. On the flip side the 305 pound weight capacity places some constraints on the weight of that gear. Anchor systems and heavy coolers can add weight quickly so you’ll have to keep an eye on that. Even so, the Trident 11 has enough room to carry a good variety of gear to last you through the day. The Trident 11 comes standard with two flush mount rod holders to keep your rods rigged and at the ready. The kayak is also loaded with accessory tracks to mount fish finders, a GoPro camera, or just about any other accessories you can think of. Two tracks flank the seat, two more flank the large tank well behind the seat, and two more run along the sides of the centrally located Modular Fishing Pod II, which has recently been redesigned. The Modular Fishing Pod, or Mod Pod II, is designed with multiple compartments. The top level compartments are smaller with room for your wallet, keys, and phone. But the top level compartments are also hinged, and flip open to expose 2 large removable boxes that extend into the belly of the boat. They are large enough to hold tackle trays, your lunch, drinks, or other accessories. Removing the boxes can provide access to extra rods, anchors, or other gear you may have stored in the belly of the boat. For storing larger gear, or gear you need to keep dry below deck, the Trident 11 has a large bow hatch with a dedicated pocket for your fish finder batteries. And in the stern the oversize stern tank well has plenty of room for a cooler or dry bags, and comes with bungees to hold down any other gear that you don’t mind possibly getting wet. Beside the comfortable ACS2 seat is a paddle keeper which allows your paddle to clip-in simply by pressing the shaft into the clip. That’s really handy when you just need to put your paddle aside momentarily. For a more secure hold, there is an additional bungee retainer to lock your paddle in. The bow features a sleeve designed to retain your paddle in the event that you need to put it down fast. But the sleeve also works really well to keep your fishing rod from slipping in the drink accidentally. Rugged foot rests are also standard with the Trident 11, and they are really easy to adjust, even with one hand. What isn’t standard is a rudder system, but it can be added as an extra add-on option for better control. And when you need to move the boat out of the water, 4 carrying handles are located around the gunnels and bow/stern. Almost all users of the Sea Ghost 130 report that it is a fantastic kayak. They compliment its durability, stability, and storage capacity. Users consistently say that after months of shopping around they could not find a better kayak to match the price and quality. The Sea Ghost tracks very well and has great features. The Prowler Big Game II from Ocean Kayak is the Mac-Daddy of fishing kayaks. If you like to stand and cast, or land fish standing up, and even paddle standing up, this is your boat. The Prowler Big Game II is as close to standing on dry land as a kayak comes. Ocean Kayak produces a good number of kayaks with serious clout among paddlers and anglers. Among them, the Big Game II is a stand-out. The design team behind the Big Game 2 found the perfect crossroads between capability, high-capacity, and real-deal stability. The Element Seating System is a remarkably smart and comfortable design. Not only is it comfortable after many hours of fishing, but it is a breathable mesh material that remains cool and breathable in hot weather. The seat easily changes from a high-ride to a lower and more stable setting if desired. But the seat can also flip up vertically to expose the space beneath the seat and provide a very large standing deck. The Big Game 2 has a wide design that allows it to slip through shallow water that would be completely inaccessible by other boats. Anglers can paddle or pole shallow water in the Big Game 2 like a miniature skiff. Creeping up on fish that don’t ever see fishing pressure is a breeze, even in just a few inches of water. The BG2 floats high, and punching through the surf is not a problem. Any water that splashes into the boat won’t last long because the scupper holes allow water to drain so you won’t be dealing with any puddles. The scuppers are also compatible with fish finder transducers if that is your preference. If you want to head for deeper water, the kayak moves pretty fast given its width. And that width provides a stability that lets you fish for just about anything. You can stalk redfish in the shallows, cast for striped bass in the bay, or even head offshore for mahi or tuna. Wherever you decide to fish, the 600 pound weight capacity lets you haul serious gear. Two flush mount rod holders behind the seat are just slightly raised to help keep your rods within reach. Rather than drilling into the hull, six accessory mounting plates are located around the perimeter of the boat. You can mount your fish finder, GoPro, more rod holders, whatever you’d like. The BG2 features the same Modular Fishing Pod, or Mod Pod as the Trident series. Designed with multiple compartments above and below deck, the Mod Pod provides storage for smaller personal items and larger items like tackle trays, lunch, drinks, or other accessories. The Mod Pod can be removed to provide access to extra tackle, anchors, or other gear you might store in the belly of the boat. A large bow hatch measures 16.5″ x 10.5″ so you can stow the gear you need to keep dry below deck. The stable design keeps things balanced if you need to access the hatch while on the water, and the click seal cover makes it easy to open and close. Below deck there is a dedicated pocket for your fish finder batteries. The stern of the Big Game II features a large tank well with bungees to hold down big gear like coolers and dry bags. Paddle keepers allow your paddle to clip-in simply by pressing the shaft into the keeper, and are located on both sides of the boat. Easily adjustable Support Track foot brace system comes standard with the BG2, and can be adjusted with just one hand. A rudder system can be added as an extra option if you like having a rudder. Two carrying handles are molded into the sides of the kayak and toggle handles are located at the bow and stern. They compliment its capability and stability in both shallow and deep water, as well as the huge storage capacity. Almost every comment on the BG2 is nothing short of a rave review with very little bad to say. The only negative that comes up is the need for a kayak trolley when carrying a good distance by yourself.